Yes, those are black lights in a headband. Works great with black light facepaint as shown in the picture above. This headband will make any black light accessories you are wearing glow! Great for halloween or music festivals. Better pictures are on their way. Ready made headbands are available in the Little Light Lab store. 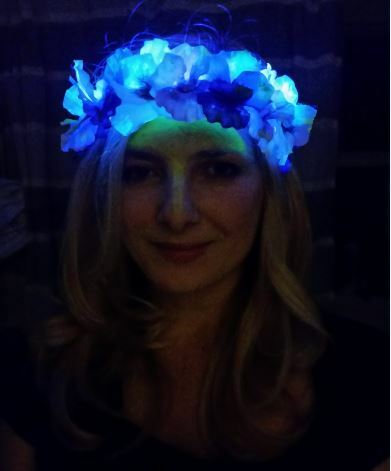 See my previous post on making LED Flower Crowns and use UV LEDs instead. Full tutorial will be posted Oct 1st! This is a great idea and a lot of people could use it. A lot of my customers (www.renohexayurt.com) who go to Burning Man could use something like this. You see so many people walking around at night with no lights on themselves and it is really dangerous. I will forward it out in a email if that is ok with you. I’m glad you like it! Please feel free to share it wherever you’d like.